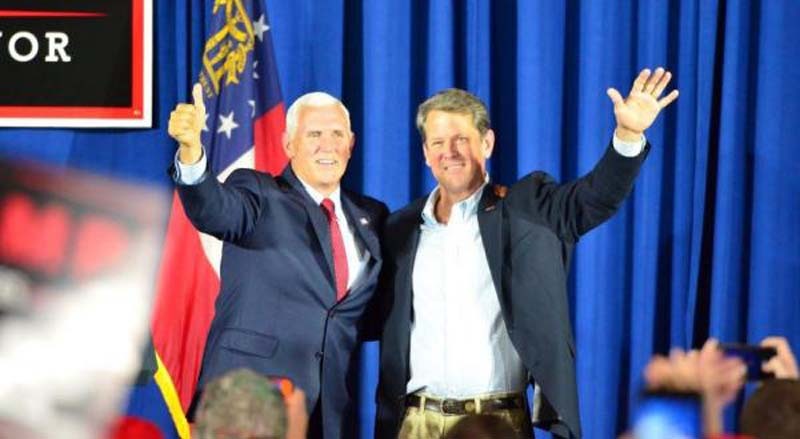 Georgia Secretary of State Brian Kemp won the Republican nomination for governor Monday night, easily beating Lt. Gov. Casey Cagle. Kemp beat Cagle 69 percent to 30 percent. He will now face Democrat Stacey Abrams in November in a race to decide Georgia's next governor. Current Georgia Gov. Nathan Deal congratulated Kemp on Twitter and urged voters to cast ballots for his fellow Republican in the fall. "Casey Cagle ran passionate, hard-fought campaigns. Now, it's time to unite behind Brian to keep moving Georgia forward," Deal said. "Together, we'll continue to keep our state the best place in the country to live, work and raise a family. This November, join me in electing Brian the 83rd governor of Georgia. [post_ads]Kemp also had strong backing from President Donald Trump, who tweeted his support for his preferred candidate earlier in the day. "Today is the day to vote for Brian Kemp. Will be great for Georgia, full Endorsement!" Trump wrote, quoting a previous tweet in which he praised Kemp's stances on several issues. Kemp, 53, is an owner of several companies in agriculture, finance and real estate, according to his website. He is running on a typical GOP platform of cutting regulations on business, restricting abortion, protecting gun rights, and depicting the Democratic Party as beholden to billionaires. "Hillary Clinton, George Soros and Nancy Pelosi all have Georgia on their mind," Kemp said on Monday, according to the Atlanta Journal-Constitution. "For months, they've been campaigning for Stacey Abrams, the out-of-touch radical liberal who cares more for her billionaire backers than for you all." "The race for #GAGov may change, but our values never will," she said on Twitter. "Service, faith & family guide our vision for GA: Affordable health care. Excellent public schools for every child. An economy that works for all."